The One World Alliance, which brings together the major airlines of the world (including Iberia, British Airways and American Airlines) organized yesterday, at the T4 in the Barajas Airport, an event dedicated to all staff, both land, cabin and AENA workers. 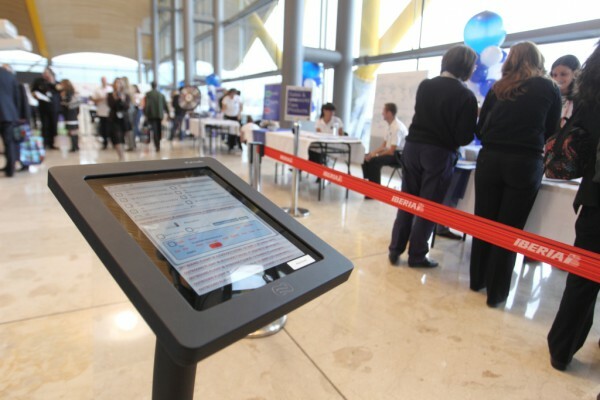 The event, in which companies promoted internal communication, had the support of GESAB, providing a solution for information points: iGESAB. It is a pedestal for iPad, made of duralumin, with 180 degree swivel head, designed and manufactured to optimize all the features of the tablets. The iGesab system is a support for iPad ideal for any organization that wants to communicate and provide services to their environment using the latest technologies and market trends (information for banking, corporate, museums, hotels, automotive, retail, education, health, directories, customer service, etc..). Since its launch in 1978, airberlin has become the second largest airline in Germany. Serves more than 160 destinations in 40 countries and joined the oneworld alliance in 2012. The main hubs of the airline are Berlin, Dusseldorf, Palma de Mallorca and Vienna. American, operates from major U.S. hubs. UU., Including Dallas / Fort Worth, Chicago OHare, Los Angeles, Miami, and New York JFK and LaGuardia, connecting travelers to an extensive network of domestic and international destinations. British Airways is one of the worlds leading airlines and a founding member of the oneworld alliance. The airline reaches over 170 destinations in 80 countries from its hub at London Heathrow. One of the most awarded airlines in Asia and a founding member of the oneworld alliance, Cathay Pacific serves about 80 destinations in over 30 countries. As the air carrier more representative of Finland, Finnair flies from its hub in Helsinki to over 60 destinations in 30 countries, including a growing number of international flights to and from Asia. Oneworld alliance partner since 1999, Iberia of Spain, serves nearly 125 destinations in 45 countries. It is the leading transportation company in the South Atlantic. Founded in 1951, Japan Airlines is a major airline companies in the world and joined the oneworld ® alliance in 2007. The airline has its main hubs in Tokyo, Osaka and Nagoya, and, with its affiliates oneworld flies to nearly 75 destinations in 20 countries. One of the air carriers and awarded largest in Latin America, LAN Airlines serves more than 70 destinations in South America, North America, Europe and the Pacific, with hubs in Chile, Argentina, Ecuador and Peru . Until suspended operations in August 2010, Mexicana was the air carrier more representative of Mexico, flying to over 65 destinations in 15 countries throughout Central America, North America, South America and Europe. A founding member of oneworld, Qantas of Australia is one of the leading airlines in the world, serving more than 70 destinations in Asia, the Pacific, Europe, North America and Africa. Royal Jordanian is the national carrier airline of the Kingdom of Jordan. It flies to about 60 destinations in 40 countries across the Middle East, Europe, Asia, Africa and North America.